FILE - Kenneth Bae, center, who had been held in North Korea since 2012, is hugged after arriving at Joint Base Lewis-McChord, Washington, Nov. 8, 2014. Kenneth Bae, an American missionary who was detained in North Korea for more than two years, said Pyongyang tried to use him as a political bargaining chip. In a rare interview with VOA's Korean service last Friday, Bae described in detail the ordeal that made him the longest-held American by the North since the Korean War. The former detainee is releasing a memoir “Not Forgotten: The True Story of My Imprisonment in North Korea” this week. Bae, 47, a South Korean-born naturalized U.S. citizen, was arrested in Rason, a city in North Korea's northeast, in November, 2012 for carrying a computer hard drive containing his missionary work and a documentary video about the country. Bae said he was not aware he was bringing the items. But, several months later the North sentenced him to 15 years of hard labor for allegedly trying to overthrow the state. “Even before the trial, they told me the sentence would not matter much. Instead, they said how the U.S. government acts after the trial would matter most,” said Bae. The sentencing came amid escalating tensions between North Korea and the U.S. following Pyongyang’s third nuclear test. “I felt a sense of rising tensions. North Koreans told me war with the U.S. was imminent,” the missionary recalled. FILE - Kenneth Bae talks to reporters at Joint Base Lewis-McChord, Washington, Nov. 8, 2014. Bae said Pyongyang sought a visit by a high-profile figure such as a former U.S. president or a secretary-level official. “They did not name a specific individual, but repeatedly mentioned the release of female journalists in 2009 as an example,” Bae said. In 2009 Pyongyang released two detained American journalists, Laura Ling and Euna Lee, after former president Bill Clinton traveled to Pyongyang and met with Kim Jong Il, then North Korean leader. Bae said the North Koreans forced him to press the U.S. government to send the high-level envoy by staging media interviews or preparation sessions. “Every letter that I sent to my family was prescreened. I had to rewrite it again and again until it got cleared,” he said. North Korea repeatedly said it would not use Bae as a political bargaining chip during his captivity. In November 2014, U.S. President Barack Obama dispatched James Clapper, Director of National Intelligence, the nation’s most senior intelligence official, to Pyongyang, resulting in the release of Bae and another American detainee Matthew Todd Miller. The American envoy, however, apparently did not bring the message Pyongyang wanted. “When I first met them, they appeared to be upset, and I felt appreciative and sorry for the troubles that my action had caused,” said Bae, referring to his meeting with a U.S. delegation led by Clapper. 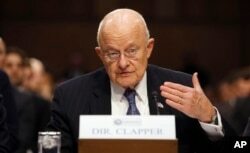 FILE - Director of National Intelligence James Clapper testifies on Capitol Hill in Washington, Feb. 9, 2016. After the trip, Clapper said he did not know whether his mission would be a success. “I was quite apprehensive, because we weren’t sure how this was going to play out,” the intelligence chief said. “I think they were disappointed, frankly, that I didn’t have some breakthrough,” Clapper said of the North Koreans. Bae said he had to perform grueling labor such as carrying rocks or shoveling coal and received verbal threats although he was not beaten or physically tortured during the captivity. While performing hard labor, his health deteriorated. He suffered back pain, diabetes and gallstones. In August 2013, he was placed in a hospital to recuperate. A month later, Washington secretly sent a National Security Council official and a medical doctor to Pyongyang to check Bae’s conditions and negotiate his release, according to Bae. Bae was born in Seoul and came to the U.S. with his family in 1985. After graduating from the University of Oregon and a seminary in St. Louis, he moved to China for missionary work. In 2010, he set up a small company in Dandong, a Chinese border town, which specialized in tours of North Korea. He had traveled to the country 17 times before he was detained. Currently, North Korea is holding two U.S. citizens on charges of committing “hostile acts” against the state.